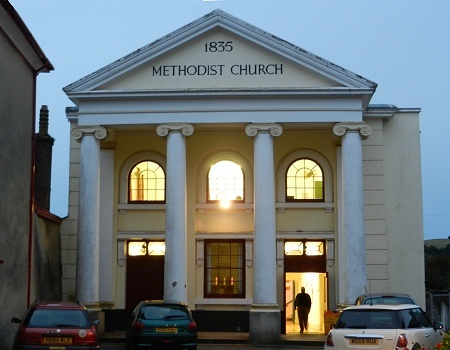 In November, we applied successfully to Teignbridge District Council to have Ashburton Methodist Church building declared a public asset. This led to an embargo on the public sale of this building, which ends on 1 June 2017. We have pledges of over £50,000 so far — an amazing feat, with generous offers of loans and gifts from individuals and organisations, most recently £5,000 from E & JW Glendinning. We are still working on other avenues but have to prepare for the possibility that it may go to auction again and we should therefore have £150,000 available to buy the building and then to start things happening there. Since the temporary reprieve was granted, ‘Ashburton Arts’ has applied for charitable status and will soon become an ‘Charitable Incorporated Organisation’ which anyone can join as a member. We have commissioned truly outstanding plans to develop the site and create a lively hub at the heart of Ashburton, offering space for people to come together to work during the day and affordable performances and classes for people across Dartmoor throughout the year. See ashburtonarts.org.uk for more. We will be eligible for grants to renovate the building, but right now we think we need to raise another £100,000 in donations and long-term loans. Can you help? Do you know someone who could? Time is of the essence and your help will be massively appreciated. We now have eight local trustees who have been working hard to put in place all the legal and bureaucratic necessities required to enable the community to own a building like this and run it for the public good. We are confident we can make it a viable enterprise that will sustain itself for years to come. We are sure that it will remain a well-loved part of the fabric of our town and the surrounding area and that it will provide inspiration and enjoyment for many people, providing opportunities that don’t currently exist. Our challenge now is to raise the remaining capital. Your help will make a difference, whatever you can offer, as a donation or a loan, from £10 to £10,000. Over 200 people have already signed up as supporters: join them now at tinyletter.com/ashburtonarts and you’ll get emails from us directly. Thank you for hosting a wonderful gig in the Chapel last night – the Fats Waller Project. Great stuff. This and other events taking place point to the potential for Ashburton to be doing a lot more more in relation to music and the arts. I have lived in Ashburton for nearly 30 years, brought my kids up here, and I have seen it change in a step wise fashion since from a functional traditional moorland town to a vibrant and interesting place to live or visit that has a strong sense of communIty. The move towards the town having its own Arts Centre is a natural progression that will act as a focus for local people and strengthen its identity, and hopefully attract people into the town – great for the local economy, great for local people, and great for the local arts and music scene. It certainly has my support. Essentially, the main condition for a loan, is that the lender should be willing to wait as long as possible before repayment, ideally for at least 5 years. We also hope that lenders will be happy for their loans to be interest-free for as long as possible. If we are unable to buy the building, then I would expect that all loans would be repaid in full immediately. If we do manage to buy the building, but for whatever reason the project fails in the next few years, then the security for the loans would be the building itself, and it would have to be sold to repay them. If people are willing to provide short-term loans, for, say 6 months – 5 years, then we’re still keen to hear from you, as that sort of funding may be necessary.